Hi! My name's Mat and I'm a crazy French guy creating video games! I've been working on my own 3D adventure video game since 2013. • Learn various skills: climbing, stealth, fight, bow, bombs, grapple and much more ! While creating this game, I also share my experience about art creation & game development in various ways: videos, making-ofs, conferences, blog articles or step-by-steps... I like to share what I learn, because I learnt a lot by watching other people do stuff! But right now, my savings are getting low and I need to take other jobs to pay for my roof and food, which means much less time available to keep working on the game. That's why I decided to start a Patreon campaign! There are very few game developers on Patreon because video game creation has an EXTREMELY LONG development time (at least the kind I do). Here, we are talking about years of full-time work to get the job done. That's why I chose a monthly pledge, to be able to keep working on the game(s) on the long run. 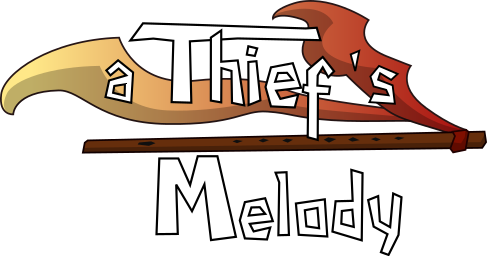 Even after "A Thief's Melody", I have plenty of other projects in mind to keep creating cool video games! So many that I already know that my whole lifetime will not be enough. In all cases, I'll keep sharing most of my experience for free. So lots of my tutorials & articles will be accessible to everybody, even non-patreon people. This means that, by pledging, in addition to the rewards listed below, you kindly contribute to knowledge-sharing for everyone, and maybe this will help other people (including yourself?) start creating awesome things somewhere in this world. This is super-craaaazy! You're from another world! This is unbelievable! oO Even in the other world, you're on top of things! I can dedicate a few full-time days a month to the video game! That's a pretty nice start! To celebrate, I'll make a bunch of free wallpapers for everybody.